Currently our conversation on Wed eve service are focused on a video series called the Truth Project. If you have not seen it, it is a great series and worth your time. 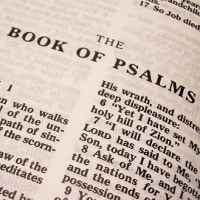 After this we will resume going through the Psalms. This has been an awesome study generating some fantastic discussion. Our format is simple, we encourage folks to bring a bite to eat if they like, we would rather you eat here than stay home because you did not have time for dinner after work. We sit in a round table format and talk about the topic of the night after some opening prayer. As we talk about prayer, I always like to think of and call our prayer time; Pala Prayer. Pala is the hebrew word used in Jeremiah 32:27 for too hard. It not only tells us that nothing is "too hard" for God, but the word as a depth that includes, nothing is beyond His power, Marvelous, Surpassing expectation, Wonderful. What it means is that when we go to God in prayer, not only can He meet the need, He can surpass expectations and answer our prayers in Wonderful and Marvelous ways! Prayer is an important part of our relationship with our Creator. At this time we do not have Nursery care. For those who need in there is a care room. When the need develops on a regular basis we will provide nursery care.